It’s the day before Christmas, and there’s that one person on your list who you can barely tolerate, a person you loathe and yet you can’t just skip over them. A mother-in-law, perhaps. Or that guy at work (you know… that guy). Or that so-called friend who keeps stabbing you in the back. What makes the perfect gift for the people in your life you absolutely hate? 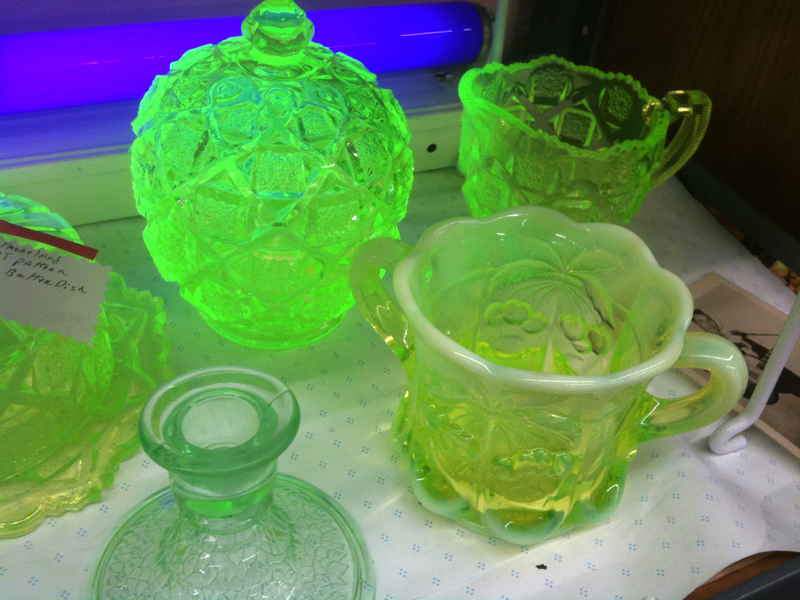 A display of uranium glass from a thrift store. Photo credit: Nerdtalker via Wikimedia Commons. How about uranium glass? It’s glass with just a tiny bit of uranium mixed in. Decades ago, before the dangers of uranium were well understood, people made glassware out of this stuff, and you can still find it in antique stores or on eBay. It’s quite beautiful, with a distinctive yellowish green color, and under certain lighting conditions it will even glow. But of course it’s radioactive. The radioactivity is fairly low and generally considered safe, but it’s still radioactive, making it the perfect gift for the special someone who you wish would just die. Posted by J.S. Pailly on December 24, 2013 in Uncategorized and tagged uranium, uranium glass, vaseline glass.